Should You Buy the Big Banks Before Earnings? Well, folks, earnings season is finally about to kick off. JPMorgan Chase (JPM), PNC Financial Services Group, Inc. (PNC) and Wells Fargo & Company (WFC) are up to bat first with their first-quarter results on Friday, before the market opens. Now, strong earnings results and sales growth, especially an earnings surprise, can lead to some big moves to the upside post-earnings. Lululemon Athletica (LULU) is a great example of this. On March 27, the company posted a 6.3% earnings surprise and the stock surged more than 15% to new all-time highs following the report. So, as the first-quarter earnings season kicks off, the question on many investors’ minds is: Should I invest in these big banks before their results roll out? Personally, I wouldn’t recommend it. As my long-time readers know, I used to be a banking analyst with the Federal Reserve. So, I know all too much about the industry, including all the “dirt” behind big scandals involving banks like Wells Fargo. As a result, I remain leery of big bank stocks. In addition, their first-quarter earnings are forecasted to decelerate. JPM is expecting earnings to decrease from $2.37 per share a year ago to $2.35 per share. Revenue of $28.5 billion is expected to decline 0.20%. Analysts have also lowered earnings estimates by 6.7%. Never a good sign. PNC’s earnings are expected to be a bit better. Earnings are forecast to increase 7% to $2.61 per share. Revenue is also forecasted to rise slightly 3.9% to $4.3 billion. However, the analyst community dropped earnings-per-share estimates by $0.04 in the past three months, which means an earnings miss is likely. WFC’s earnings forecast is more mixed. Earnings are expected to come in at $1.10 per share, a solid 14.6% increase from the $0.96 per share earned last year. However, sales growth is expected to fall 4.3% to $21 billion. The bank also doesn’t have a very strong track record of earnings surprises, and in light of lowered forecasts in the past three months, it’s likely to miss estimates again. 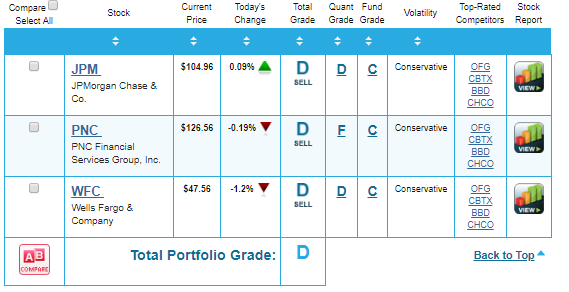 However, what really stands out to me with these three banking stocks are their ratings in my Portfolio Grader. Just take a look below. As you can see, each stock has a total “D” rating, and that makes them all automatic sells. Remember, Portfolio Grader assess stocks on two key metrics: a Fundamental Grade and Quantitative Grade. The Fundamental Grade for the banks isn’t horrible, but the C-ratings keeps them as holds. However, the Quantitative Grade is very telling. In fact, PNC holds an “F” rating here. The Quantitative Grade measures the buying pressure, which is very important. Think of it as “following the money.” The more money that floods into a stock, the more momentum a stock has to rise. In the case of JPM, PNC and WFC, the money flow is nothing more than a drip. As such, these stocks do not represent good buying opportunities right now. We also need to keep in mind that we’re going to see a deceleration in the S&P 500’s earnings overall. Corporate earnings are expected to experience a massive deceleration over the next three quarters. In fact, according to FactSet Earnings Insight, the S&P 500’s first-quarter earnings are now forecast to decline 4.2% year-over-year, down from previous forecasts for 2.8% annual earnings growth. So, in this environment of slowing earnings, it’s more important than ever to stay focused on companies that are able to maintain strong earnings momentum. If you want to invest in companies with superior fundamentals, I highly recommend that you check out my Growth Investor service. Stocks only make it onto my Elite Dividend Payers Buy List if they have AA-ratings, which means they earned an “A” from both Portfolio Grader and my other stock-rating system, Dividend Grader. And even better, my Growth Investor stocks, which are recommended largely based on their grades in Portfolio Grader and Dividend Grader, are characterized by 17.3% average annual sales growth and 63.6% average annual earnings growth, so you know you’re investing in stocks with strong earnings and sales momentum. The bottom line: Stay away from the big banks. Instead, focus on companies with strong fundamentals that are seeing good money flow. To make sure you’re properly “locked and loaded” before more earnings come in, you can sign up for my Growth Investor service here.